$1,000 Reward! Please help find Blake! Boston Terrier found 4 years after disappearing - Fri Apr 6, 2007 1:16 pm (PST) - Lost Kansas City dog turns up in Billings By The Gazette Staff and Associated Press A Boston terrier named Mickey who disappeared four years ago from his suburban Kansas City backyard was reunited with his owners this week after officials at the Billings animal shelter identified the dog with help from a microchip implant. 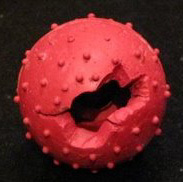 Check your plastic and latex dog toys. Most are made in China and may contain lead! The polyester toys should not contain lead paint.